The Zhuang languages (autonym: Vahcuengh, pre-1982: Vaƅcueŋƅ, Sawndip: 話僮, from vah 'language' and Cuengh 'Zhuang'; simplified Chinese: 壮语; traditional Chinese: 壯語; pinyin: Zhuàngyǔ) are any of more than a dozen Tai languages spoken by the Zhuang people of southern China in the province of Guangxi and adjacent parts of Yunnan and Guangdong. 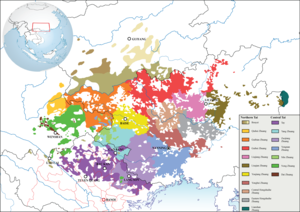 The Zhuang languages do not form a monophyletic linguistic unit, as northern and southern Zhuang languages are more closely related to other Tai languages than to each other. Northern Zhuang languages form a dialect continuum with Northern Tai varieties across the provincial border in Guizhou, which are designated as Bouyei, whereas Southern Zhuang languages form another dialect continuum with Central Tai varieties such as Nung, Tay and Caolan in Vietnam.Standard Zhuang is based on the northern Zhuang dialect of Wuming. Geographic distribution of Zhuang dialects in Guangxi and related languages in Northern Vietnam and Guizhou. The Tai languages are believed to have been originally spoken in what is now southern China, with speakers of the Southwestern Tai languages (which include Thai, Lao and Shan) having emigrated in the face of Chinese expansion. Noting that both the Zhuang and Thai peoples have the same exonym for the Vietnamese, kɛɛuA1, from the Chinese commandery of Jiaozhi in northern Vietnam, Jerold A. Edmondson posited that the split between Zhuang and the Southwestern Tai languages happened no earlier than the founding of Jiaozhi in 112 BC. He also argues that the departure of the Thai from southern China must predate the 5th century AD, when the Tai who remained in China began to take family names. Zhāng Jūnrú's (张均如) Zhuàngyǔ Fāngyán Yánjiù (壮语方言研究 [A Study of Zhuang dialects]) is the most detailed study of Zhuang dialectology published to date. It reports survey work carried out in the 1950s, and includes a 1465-word list covering 36 varieties of Zhuang. For the list of the 36 Zhuang variants below from Zhang (1999), the name of the region (usually county) is given first, followed by the specific village. The phylogenetic position of each variant follows that of Pittayaporn (2009) (see Tai languages#Pittayaporn (2009)). The Zhuang language (or language group) has been divided by Chinese linguists into northern and southern "dialects" (fangyan 方言 in Chinese), each of which has been divided into a number of vernacular varieties (known as tǔyǔ 土语 in Chinese) by Chinese linguists (Zhang & Wei 1997; Zhang 1999:29-30). The Wuming dialect of Yongbei Zhuang, classified within the "Northern Zhuang dialect," is considered to be the "standard" or prestige dialect of Zhuang, developed by the government for certain official usages. Although Southern Zhuang varieties have aspirated stops, Northern Zhuang varieties lack them. There are over 60 distinct tonal systems with 5–11 tones depending on the variety. Zhang (1999) identified 13 Zhuang varieties. Later research by the Summer Institute of Linguistics has indicated that some of these are themselves multiple languages that are not mutually intelligible without previous exposure on the part of speakers, resulting in 16 separate ISO 639-3 codes. Hongshui He 红水河 (2,823,000 speakers): Laibin South, Du'an, Mashan, Shilong, Guixian, Luzhai, Lipu, Yangshuo. Castro and Hansen (2010) distinguished three mutually unintelligible varieties: Central Hongshuihe (ISO 639 zch), Eastern Hongshuihe (ISO 639 zeh) and Liuqian (ISO 639 zlq). Tày-Nùng language is also considered one of the variaties of Central Tai and shares a high mutual intelligibility with Wenshan Dai and other Southern Zhuang dialects in Guangxi. Pyang Zhuang and Myang Zhuang are recently described Central Tai languages spoken in Debao County, Guangxi, China. the 81 symbols of the Poya 坡芽 Song Book used by Zhuang women in Funing County, Yunnan, China. The Zhuang languages have been written in the ancient Zhuang script, Sawndip, for over a thousand years, and possibly Sawgoek previous to that. Sawndip is a Chinese character-based system of writing, similar to Vietnamese chữ nôm; some sawndip logograms were borrowed directly from Han characters, whereas others were original characters created from the components of Chinese characters. It is used for writing songs about every aspect of life, including in more recent times encouraging people to follow official family planning policy. There has also been the occasional use of a number of other scripts including pictographics proto-writing, such as in the example at right. In 1957 Standard Zhuang using a Cyrillic script was introduced, and in 1982 this was changed to Latin script; these are referred to as the old Zhuang and new Zhuang, respectively. Bouyei is written in Latin script. ^ Hammarström, Harald; Forkel, Robert; Haspelmath, Martin, eds. (2017). "Daic". Glottolog 3.0. Jena, Germany: Max Planck Institute for the Science of Human History. ^ Bradley, David (2007). "East and Southeast Asia". In Moseley, Christopher (ed.). Encyclopedia of the World's Engangered Languages. Routledge. pp. 349–422. ISBN 978-1-135-79640-2. p. 370. ^ A1 designates a tone. ^ Pittayaporn, Pittayawat (2009). The Phonology of Proto-Tai (Ph.D. thesis). Department of Linguistics, Cornell University. ^ a b c Zhang Yuansheng and Wei Xingyun. 1997. "Regional variants and vernaculars in Zhuang." In Jerold A. Edmondson and David B. Solnit (eds. ), Comparative Kadai: The Tai branch, 77–96. Publications in Linguistics, 124. Dallas: Summer Institute of Linguistics and the University of Texas at Arlington. ISBN 978-1-55671-005-6. ^ Luo Yongxian. 2008. "Zhuang". In Diller, Anthony, Jerold A. Edmondson, and Yongxian Luo eds. 2008. The Tai–Kadai Languages. Routledge Language Family Series. Psychology Press. ISBN 978-0-7007-1457-5. ^ Johnson, Eric C. (2007). "ISO 639-3 Registration Authority, Change Request Number 2006-128" (PDF). ^ Tan, Sharon (2007). "ISO 639-3 Registration Authority, Change Request Number 2007-027" (PDF). ^ a b 张均如 / Zhang Junru, et al. 壮语方言研究 / Zhuang yu fang yan yan jiu [A Study of Zhuang dialects]. Chengdu: 四川民族出版社 / Sichuan min zu chu ban she, 1999. ^ Hansen, Bruce; Castro, Andy (2010). "Hongshui He Zhuang dialect intelligibility survey". SIL Electronic Survey Reports 2010-025. ^ Jackson, Bruce; Jackson, Andy; Lau, Shuh Huey (2012). "A Sociolinguistic Survey of the Dejing Zhuang Dialect Area". SIL Electronic Survey Reports 2012-036. .
^ "SIL Electronic Survey Reports: A sociolinguistic introduction to the Central Taic languages of Wenshan Prefecture, China". SIL International. Retrieved 2012-04-06. ^ Liao Hanbo. 2016. Tonal development of Tai languages. M.A. dissertation. Chiang Mai: Payap University. Zhuàng-Hàn cíhuì 壮汉词汇 (Nanning, Guǎngxī mínzú chūbǎnshè 广西民族出版社 1984). Edmondson, Jerold A. and David B. Solnit, ed. Comparative Kadai: The Tai Branch. Dallas, TX: Summer Institute of Linguistics; [Arlington]: University of Texas at Arlington, 1997. Johnson, Eric C. 2010. "A sociolinguistic introduction to the Central Taic languages of Wenshan Prefecture, China." SIL Electronic Survey Reports 2010-027: 114 p. http://www.sil.org/silesr/abstract.asp?ref=2010-027. Luo Liming, Qin Yaowu, Lu Zhenyu, Chen Fulong (editors) (2004). Zhuang–Chinese–English Dictionary / Cuengh Gun Yingh Swzdenj. Nationality Press, 1882 pp. ISBN 7-105-07001-3. Wang Mingfu, Eric Johnson (2008). Zhuang Cultural and Linguistic Heritage. The Nationalities Publishing House of Yunnan. ISBN 7-5367-4255-X. Zhang Junru 张均如, et al. 壮语方言研究 / Zhuang yu fang yan yan jiu [A Study of Zhuang dialects]. Chengdu: 四川民族出版社 / Sichuan min zu chu ban she, 1999. Zhou, Minglang: Multilingualism in China: The Politics of Writing Reforms for Minority Languages, 1949–2002 (Walter de Gruyter 2003); ISBN 3-11-017896-6; pp. 251–258. Look up Category:Zhuang language in Wiktionary, the free dictionary. Wikimedia Commons has media related to Zhuang writing. Field Notes on the Pronominal System of Zhuang "A major case of language shift is occurring in which the use of Zhuang and other minority languages is restricted mainly to rural areas because Zhuang-speaking villages, like Jingxi, which develop into towns become more and more of Mandarin-speaking towns. Zhuang-speaking villages become non-Zhuang-speaking towns! And children of Zhuang-speaking parents in cities are likely not to speak Zhuang as a mother-tongue."